Here to listen to our patients. 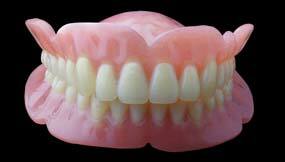 A complete denture consist of the replacement of natural teeth by artificial ones. 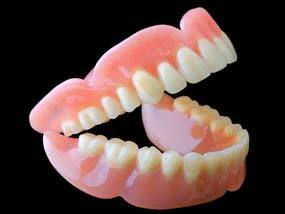 Dentures or also known as false teeth are supported by the surrounding soft and hard tissues of the oral cavity. They allow a patient to regain their mastication, pronunciation, smile and self-esteem. 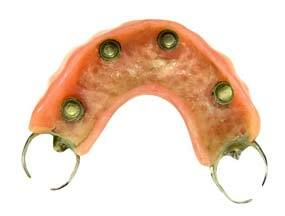 You are concerned about the aesthetic aspect of your upper denture? 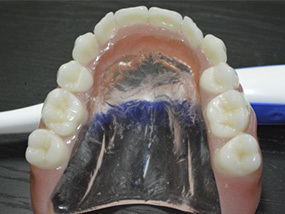 For a more discreet upper prosthesis, technology now allows us to fabricate a transparent palate. 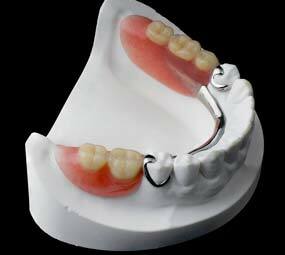 It’s an aesthetic element that can make a world of difference..
Also available when fabricating an upper prosthesis is a metal palate which allows a much thinner palate. 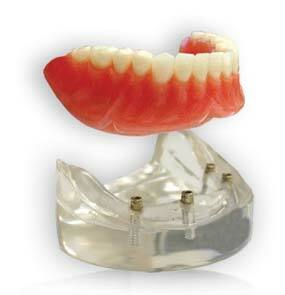 This is ideal for patients who display strong masticatory forces and tend to break their dentures. 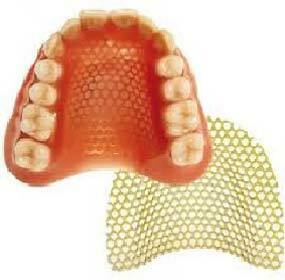 Wire mesh or fiber (Fibre Force) helps strengthen the palatal area of the denture while maintaining an attractive appearance. 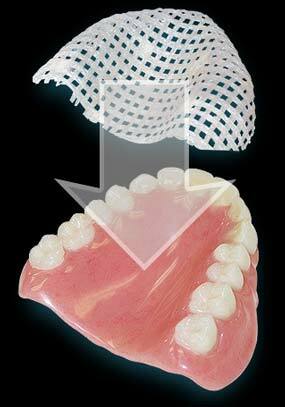 The lower prosthesis with a soft base allows for easier chewing and reduces soreness and ulcers. Michel Puertas offers a free annual cleaning for 5 years. 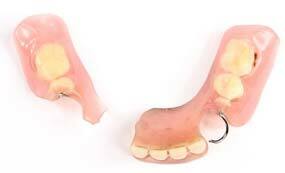 Whether you are missing one or multiple teeth, a partial denture is a device that can help you. Replacing missing teeth is important to improve mastication, aesthetics and prevent movement of the remaining natural teeth. 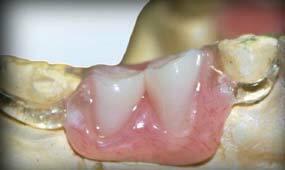 Acrylic partial dentures are made of acrylic resin covering a larger area and usually carry a certain thickness. They can be made with or without clasps and represent a low cost alternative when suited. . 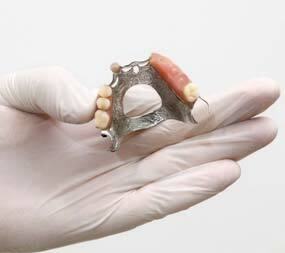 Partial metal dentures (vitallium) are stronger and often thinner than the acrylic partial denture. Retentive clasps can be made of metal or transparent. 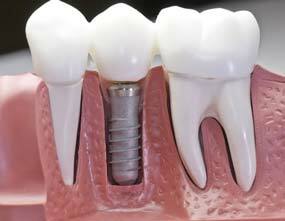 Implants are artificial titanium roots harmless to your health that integrate with the bone. 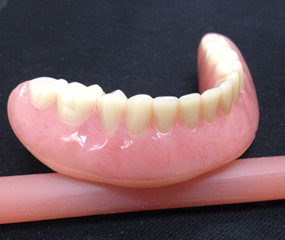 Full dentures on implants are prostheses that are fixed to the maxilla (upper, lower or both) by implants in order to prevent them from moving or injury. There are many treatment plans, fixed or removable prosthesis on implants (with or without bar).For more information, call us for a free consultation . 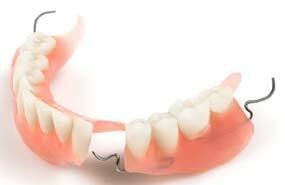 Once your complete dentures on implants completed, you will find an effective chewing, comfort and improved aesthetics. 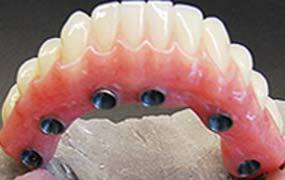 An implant supported partial is a great alternative if your are missing one or multiple teeth. This treatment alternative is less expensive and displays very aesthetic results. 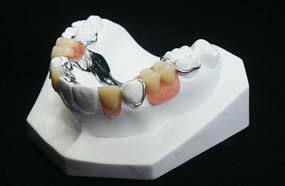 Forget about clasps and food under your denture when you choose to replace your missing teeth with implant supported crowns and bridges. This option offers you the ability to regain the function and aesthetic of your natural teeth, allowing you to bite into life like nature intended!!! 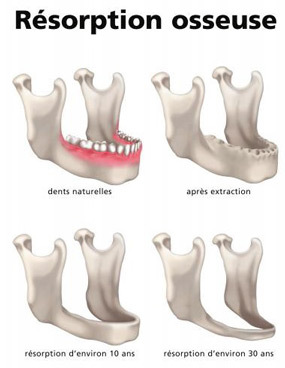 Dr Patrice Dagenais offer dental implants, crowns on implants, bridge on implants, bone grafts, sinus grafts, gum grafts, teeth extraction ,wisdom tooth extraction and much more! Come and meet us! When your denture becomes ill fitting, one of the solutions may be relining to promote better retention. 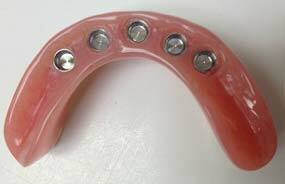 Your denturist will take an impression in the prosthesis and fill the interior aspect with acrylic. 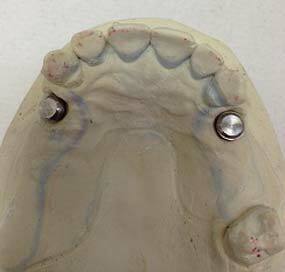 Relining the bottom prosthesis with soft base allows for easier chewing and fewer injuries. 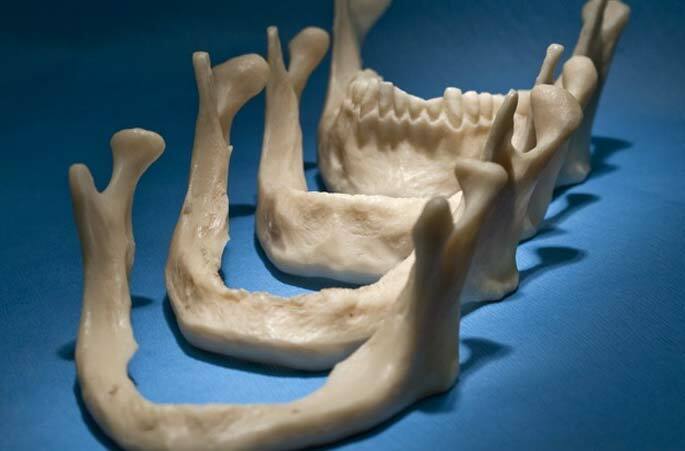 Aging causes gradual bone loss and subsequent gum loss. 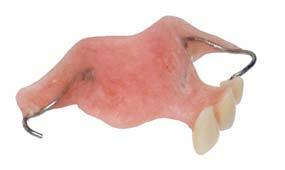 It is therefore sometimes necessary to reline (soft or hard) your dentures approximately 3 years after initial delivery. 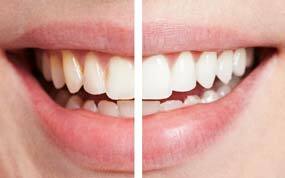 Before any home whitening treatment, you must undergo a complete and comprehensive examination by your dentist to optimize the results of your bleaching treatment. A dental cleaning is often performed prior to start bleaching in order to give you the most radiant smile supported by healthy gum tissue. 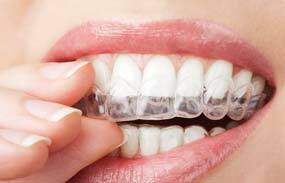 The denturist will take impressions of your teeth and fabricate soft trays which will be used in conjunction with a whitening gel. 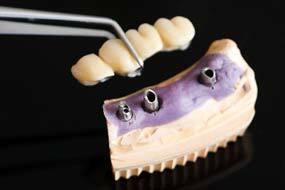 The denturist will thoroughly explain the procedure( for home treatment) to get the desired results. Results will vary from one person to another. 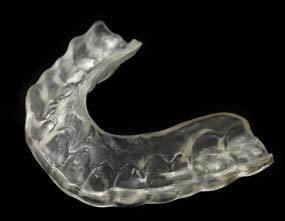 Bruxism is an unconscious movement of the jaw masticatory muscles causing friction of the teeth. 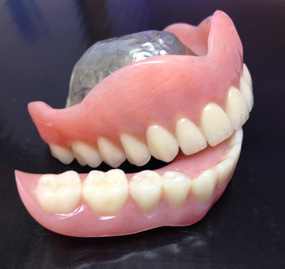 A night guard (hard plastic appliance) is made from an impression of the teeth. When worn it prevents direct contact between upper and lower teeth , reducing grinding and premature tooth wear and all related jaw muscle pain. 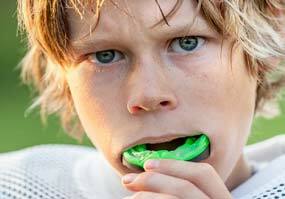 The purpose of a mouth guard is to protect teeth and absorb shocks It also reduces risks of cerebral concussions. 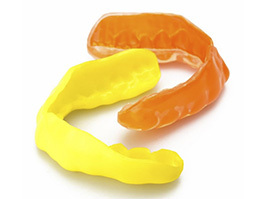 The custom mouth guard is made from a precise impression of the teeth. 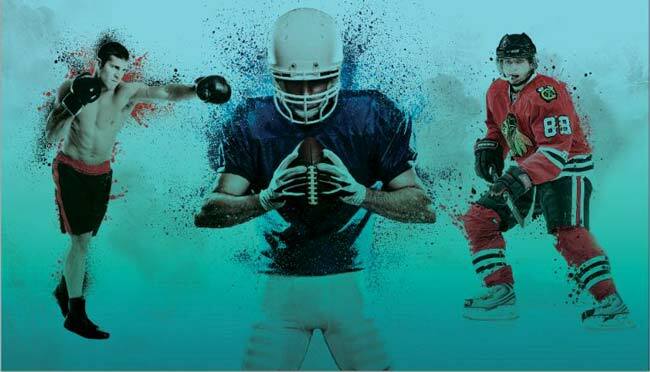 It’s thickness will depend on the activity performed and each appliance can be customized with different colors to match your personality (vibrant colors of your favorite sport’s team). 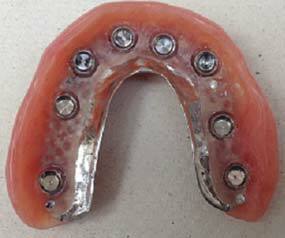 It is often possible to repair a dental prosthesis. You should never try to repair it with contact cement as it may damage your appliance. Having our laboratory on the premises, all repairs are carried out around 1 hour!! We respond quickly to emergencies as we like to see you smile! Michel Puertas offers a free cleaning for your dentures.